Sometimes events like a battle during wartime or a sexual assault are so horrific that they seem to leave a hard-to-remove scar on the brains of some of the people who endure them. There are some therapies that can help but their effects often fade over time. 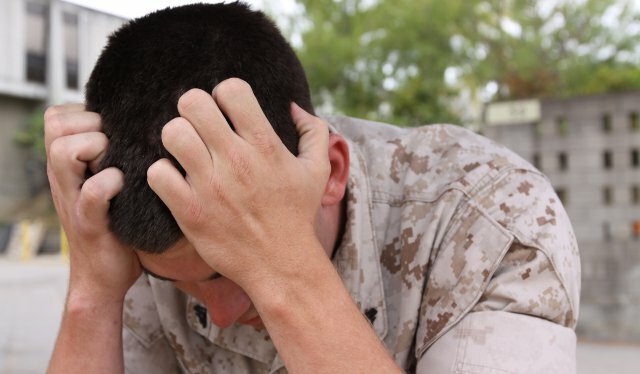 These sufferers of post-traumatic stress disorder (PTSD) end up reliving the experience over and over. The results of a new study might give these people hope. The researchers found that giving mice suffering from PTSD a certain class of drugs along with therapy could cure the mice when therapy alone could not. These HDAC inhibitors helped remove the scars so that therapy could really heal the brains of these mice. And the term scar isn’t too far from reality. In PTSD, the scar is made up of chemical groups scattered around certain genes that end up there as a result of these experiences. These “epigenetic” marks make the brain resistant to the rewiring that therapy can provide. So it makes sense that removing them would make the brain more receptive to therapy. Of course a mouse is not a person but this is still a very promising line of research. Even if we don’t end up combining HDAC inhibitors with therapy in people, the study may still help us find key genes to target in other ways. Research like this may one day help find better treatments for the 7-8% of people who will suffer from this devastating disorder at some point in their lives. The first step in the study was to create mice with PTSD. The researchers did this with a sort of cruel Pavlovian experiment—they shocked the feet of the mice and played a noise at the same time. After a while, the sound alone was enough to cause the mice to freeze. The sound could now trigger the traumatic memory. The next step was to see if the most common treatment for PTSD, extinction therapy, could help these mice. In extinction therapy the patient relives the situation in a safe environment so they can learn that it can’t hurt them anymore. In the case of the mice, the researchers wanted to see if the mice stopped being scared of the noise if they heard it repeatedly without the shock. 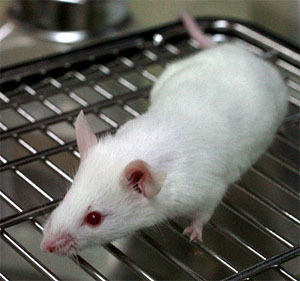 Extinction therapy could cure these mice if it was done within one day of the trauma but not after a month. By then the memory had become hardwired into their tiny rodent brains. To undo this rewiring, the researchers gave the mice a class of drugs called HDAC inhibitors. The idea was that these drugs would prime the mouse’s brain to respond better to the therapy. And it did. Mice that received both HDAC inhibitors and extinction therapy one month after the trauma were no longer afraid of the noise. These mice had overcome their PTSD and so no longer froze when they heard the noise. An important point is that neither treatment worked by itself. Mice given just the drugs or just extinction therapy after a month were still frightened by the noise. Both were needed for the cure. HDAC inhibitors can prime a mouse’s DNA to rewiring through new experiences but they won’t rewire the brain themselves. They just make the therapy more likely to take. A memory can become fixed in the hippocampus through changes in how certain genes are used there. The event does not cause a change in the gene itself. Instead, different chemical groups are placed near the gene. These “epigenetic” changes then affect how well a cell can read that particular gene. The DNA that contains our genes is wrapped up around proteins called histones. 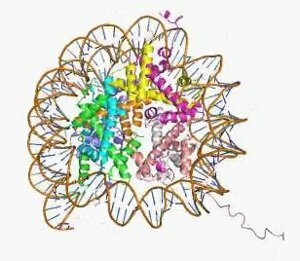 Not only do these histones allow for 6 feet of DNA to be crammed into a nucleus that is only 10 microns across, but they can also affect how a gene works. If histones are locked down on certain parts of a gene, that gene is hard for the cell to read. Cells have a hard time prying these histones away and getting to the gene. These genes are used at a lower level. Conversely, if a histone rests lightly on a gene, then that gene is more easily read. The cell can easily get to this DNA and so the gene is read at a higher level. Cells can make histones bind more or less tightly by adding or removing acetyl groups from them. Since both the acetyl group and the DNA are negatively charged, extra acetyl groups means a histone and DNA are a bit less attracted to each other. These genes are easier to read and so are turned up. An HDAC inhibitor keeps the cell from removing acetyl groups from histones. The end result is that the DNA has more acetylated histones which means some genes are turned up. In these experiments, keeping histones acetylated primed the mouse brain to accept the extinction therapy.